Wickes has a portfolio of more than 200 stores across the UK supplying DIY and trades..
Our stores and website stock a huge selection of own-brand home improvement products designed to meet the requirements of all DIYers and tradesmen undertaking DIY projects, general repairs and maintenance. We believe that Wickes provides the best value for money in the DIY market, and we are committed to strengthening our position as the destination DIY and home improvement store for tradesmen and DIYers of every level. 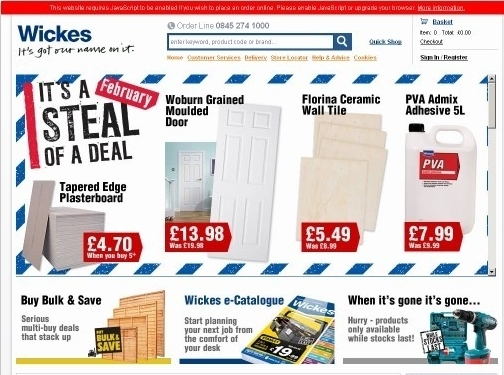 There are currently over 14,000 products in the Wickes range available to order in-store, online or by telephone. We have a number of themed in-store showrooms highlighting our range of kitchens and bathrooms, and also stock a comprehensive range of FREE 'Good Idea" and 'Build Your Skills" leaflets, which have been designed to inform and advise customers on a number of key DIY topics (you can also find these online). As a company, we are always looking for ways to help improve the environment - for example, by recycling waste packaging material generated by our stores. Whether they are located in the UK or further afield, manufacturers and suppliers of Wickes products must meet our high standards for environmental awareness. We ensure that they minimise the impact that their production activities have on the immediate surroundings, and only produce goods that meet or exceed our demanding quality targets. Well-established UK based company - established in 1972, and now with more than stores thoughout the country - providing DIY and home improvement products. Website includes e-commerce facilities, delivery and returns information, FAQs, store locator facility, how-to videos and other help, company contact details.